How can you be sure that LatinSummer is the right program for your child? Because we truly believe in its value - but don't take our word for it. 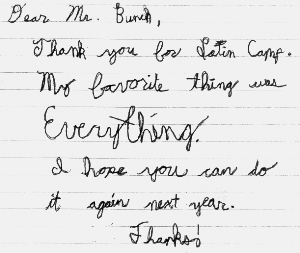 The parent and student evaluations of the LatinSummer programs continue to be overwhelmingly positive. Many parents agree that their children's lives were marked not only by academic growth but also by personal growth during the program. One parent in particular has noted that "the conversations that I've had with my child as a result of this program are some of the best we've ever had." One of our students may have put it best when he wrote us the touching and personal letter pictured at right. Find more information about the program at the LatinSummer homepage and watch a video about LatinSummer in the news! To provide a challenging academic experience for high ability learners. To develop logical reasoning and critical thinking skills. To promote openness, creativity, and enthusiasm for learning. To encourage the free communication of ideas. To expose students to Latin and to Roman society and culture. 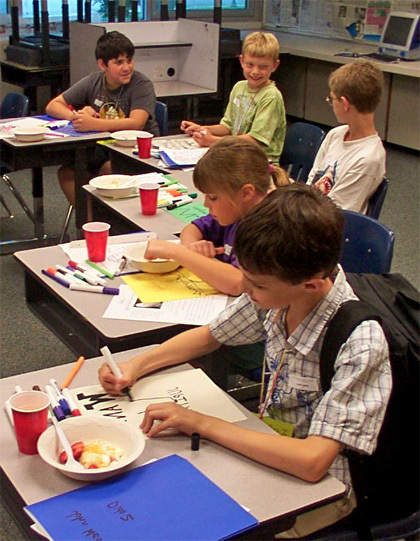 To expose students to the mythology of the ancient Greeks and Romans. To encourage students to make connections between Latin and their own language. To encourage students to apply knowledge of the classical world to their own world. Individual Autonomy: To prepare for life as an individual capable of making open-minded, reasoned, and informed choices of one's values, goals, and career. In support of this ideal, liberal education broadens one's perspective, making possible the evaluation of personal beliefs and values in the light of alternative points of view. Social Responsibility: To acquire a sensitivity to the consequences of one's life and conduct for other people and for our natural and social environments. Personal Fulfillment: To prepare for a fulfilling life, one rich in the satisfactions derived from art, music, literature, science, and the other achievements of culture. A liberally educated person experiences the joy of learning and discovery in all the facets of life. Cultural Literacy: To gain the background knowledge and other skills necessary for understanding written and oral communication from a wide range of sources, particularly those which are recognized as constituting the mainstream of our political, cultural, business, and artistic worlds. Similarly, to acquire the knowledge and skills necessary for communication to such audiences. Life and Career Enhancement: To acquire the broad-based, nonprofessional, higher-order skills that enable an individual to flourish in a wide range of careers or other endeavors. Political Autonomy: To prepare for responsible citizenship in a democracy. This requires understanding the issues to be decided by the political process and an ability to make informed and rational choices among alternative policies, either directly or by election of representatives committed to those goals. Ideally, many individuals will have the desire and the ability to participate personally in governance at some level, which would require the aforementioned skills to a high degree along with the ability to communicate one's views effectively and persuasively to others. LatinSummer is a joint project of Ascanius and local schools, school systems, or colleges and universities, with direct funding and/or administrative support provided by the host institution, and additional funding from other individuals and organizations that support the classics.